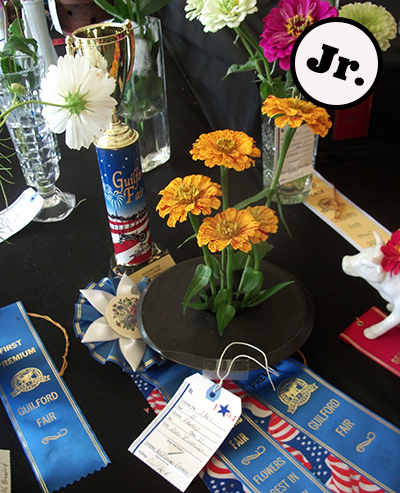 Unless otherwise stated, all flowers & foliage must be grown by the exhibitor. Entries close at 5:00 P.M., Saturday, September 15, 2018. Exhibits will be accepted ONLY between 4:00 P.M. and 8:00 P.M., Thursday, September 20. All exhibits must remain in place until closing, 7:00 PM Sunday, September 23. The tent will close at 6:00 P.M. and exhibits will be available after 7:00 P.M. No exhibits may be removed from the tent until 7 PM. Always design your exhibits to stay fresh through Sunday. Please use sturdy, non-tippy containers. Classes are designated by exhibitor’s age group. Include child’s age on Entry Form. Ribbons awarded for First, Second, and Third in each class.